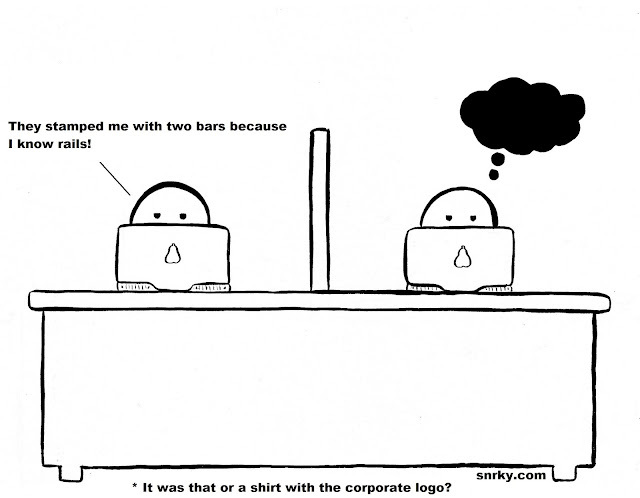 Snrky: It was that or a shirt with the corporate logo? It was that or a shirt with the corporate logo? Ah...I did one very close to this once before. But one is more management focused. And one is more development focused. That pretty much captures the schizophrenic nature of my job nowadays. One day it's security and management, the next day it's architecture estimations, Powershell scripts, and reviewing C Sharp modules that are in desperate need of being rewritten to centralize overly reused bits of logic. I think it would be fun to take brands and turn them into developer-centric brands, but that just screams badges, which has already been done. That whole mess just makes me feel like I'm back in Scouting earning merit badges with a focus on requirements and metrics rather than learning what I really need to learn. Snarky: They stamped me with two bars because I know rails! Title: It was that or a shirt with the corporate logo?